I’m on Facebook & have quite a few friends that are horse gals too. They either still ride but most were riders in the past, before life, family, responsibilities, etc. came into play. Today one of my friends posted a lovely video of a horse cantering, from the rider’s perspective, on a pristine snow-covered trail. My friend wrote of how she loved riding & that she hoped to get the chance to ride again someday, before she’s too old. And another friend commented on her video post that this is why she has horses now, because she realized that she didn’t have many ridable years left. Both of these women are dynamic, accomplished & successful. And both are younger than I am. Yet both felt they didn’t have a lot of time left in their lives to ride & that made me sad, then it made me really mad. I had been putting this blog together for quite a while and until today’s Facebook posts, I had hidden this site from view while I thought I needed to work more to perfect things. After reading my friend’s comments on Facebook, I said heck with that – Old Gray Mares NEEDS to live & go live NOW! Why do we think that we can’t do what we love because we’re not young? What is young anyway? And what really defines old? A good friend lamented that he was too old to go skiing any longer and he’s younger than I am. I’m over 50 & certainly not planning to stop doing what I love & absolutely capable of doing, just because the number of years I’ve been on this earth is over 25 or exceeds any arbitrary number. 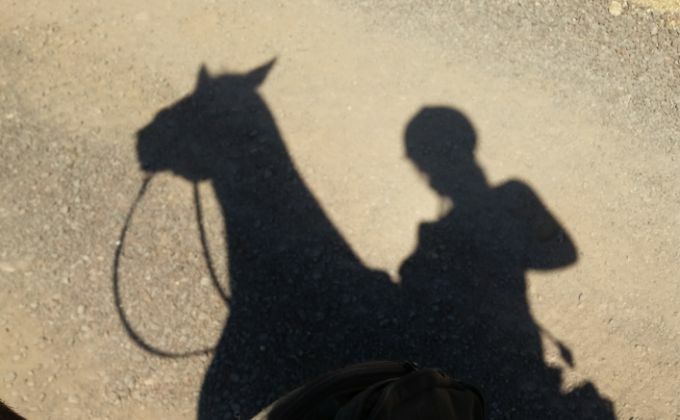 Two days ago, I was in the Arizona desert, and at one point at a full gallop on my mare – loving every second! I should prefer sitting in a rocking chair because my age & society dictates that I should because I’ve celebrated X number of birthdays? Who made THAT rule up?! Not me! I want to rock ‘n roll in a saddle, on top of my horse, with a blue sky above me & the sun shining in my face. So for all of you out there with horse dreams that you think are over… know that your dreams are GOOD dreams. Don’t give them up. Find a way to do what you want to do & make it happen. Every Old Gray Mare alive has faith in you!